UFO FLY-BY SALT LAKE CITY? AND THE 2002 WINTER OLYMPICS ? Did you see something? We want to know! The Winter Olympics in Salt Lake City will be attracting all sorts of tourists -- including E.T. That's according to a Phoenix-based hypnotherapist who claims she's been in contact with ETs all her life. Victoria Liljenquist says her "space brothers" have told her they plan to fly a cigar-shaped craft over thousands of Olympic spectators on February 21, sometime between 12 p.m. and 5 p.m., weather permitting. That's just around the same time as the gold medal round for the women's curling event. 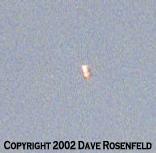 Liljenquist says the UFO appearance "won't be subtle" because ET motherships are anywhere from 250 to 1000 miles long. She says the ETs have chosen the Olympics to make their big debut because it ensures a world wide audience will see "undeniable proof of extraterrestrials' presence." On Thursday, February 21st, 2002 on a clear, sunny day in Salt Lake City, Utah a most portentious event occurred, as predicted by Victoria Liljenquist. At precisely 2:25 PM, a single small cigar-shaped craft flew over the Wasatch mountains in a brief fly-by. The event was captured on a video camera, and the footage was transferred to a news crew from local Salt Lake TV station on channel 2. The footage aired on the 10 PM news. also a sighting the previous evening that had been captured that showed a ship that split into two separate craft that was not shown on TV. There was also a third event at 2:45 where another craft flew-by briefly. the east mountains. She went into the store, did her shopping, and upon exiting the store, she looked up at the location where the 'cloud' had appeared. She described seeing a small red object that flew along the east mountains. She confirmed telepathically that it was indeed a craft. Later, at Victoria's place, I was standing on her balcony looking out over the city. This was about 5PM. In awe, I witnessed three groups of five F-16 interceptor jets fly over the city. They were flat moving! I felt, intuitively, that they had been scrambled due to the UFO sightings that had been coming in. all of the other prophecies of peace, prosperity, and abundance on this planet. I believe that the Spiritual Hierarchy of our planet, as well as the Ascended Masters and the Angelic Hosts are now working with the awakened humans right now. Our job is now to help awaken the rest of our sleeping brothers and sisters. On Tuesday, myself and two others journeyed to the shores of the Great Salt Lake and performed a ceremony that 'unplugged the stopper' over this body of water. I saw the entire lake turned into a transducer that radiated a massive column of the golden light of Peace and Love that will assist in our Planetary Transformation. Be in Joy, my blessed friends and fellow Lightworkers. Be As One. UFOS Made Appearance in Salt Lake City ?